Identification of novel molecular biomarkers will improve the management of patients with gastric cancer (GC). Prenyl diphosphate synthase subunit 2 (PDSS2) is required for coenzyme Q10 biosynthesis and acts as a tumor suppressor; however, the role and regulatory mechanisms of PDSS2 in GC are not understood. The aim of this study was to determine expression status and regulatory mechanisms of PDSS2 in GC. Associations between expression and methylation of PDSS2 were evaluated using GC cell lines. The clinical significance of PDSS2 expression was evaluated using 238 pairs of surgically resected gastric tissues with subgroup analysis based on GC subtypes. The expression of PDSS2 mRNA was decreased in 73% of GC cell lines compared with the control non-cancerous cell. The PDSS2 promoter was hypermethylated in cells with decreased PDSS2 expression, and treating these cells with a methylation inhibitor reactivated PDSS2 expression. GC tissues expressed significantly lower mean levels of PDSS2 mRNA compared with adjacent normal tissues (P <0.001). The expression pattern of PDSS2 protein was consistent with that of its mRNA. The decrease of PDSS2 mRNA expression in GC tissues (less than half the level of expression detected in the corresponding normal adjacent tissues) correlated significantly with elevated levels of carbohydrate antigen 19-9 (P = 0.015), lymph node metastasis (P = 0.022), and shorter recurrence-free survival after curative resection (P = 0.022). Further, multivariate analysis identified PDSS2 mRNA expression as an independent prognostic factor (hazard ratio 1.95, 95% confidence interval 1.22–3.09, P = 0.005), and its expression pattern and prognostic significance were similar among three GC subtypes. PDSS2 encodes a putative tumor suppressor, and we show here that its expression was regulated by hypermethylation of its promoter in GC cells. Inhibition of PDSS2 mRNA expression may serve as a novel biomarker of all types of GC. Although the incidence of gastric cancer (GC) is declining in most developed countries, it remains one of the most common causes of cancer-related death worldwide -. Appropriate stratification of patients is a pivotal aspect of individualized treatment, leading to reducing mortality from this cancer ,. According to its epidemiology, pathology, and location in the body, GC is recognized as three distinct malignancies arising in the same organ -. Shah et al. proposed a convincing classification of GC according to histopathologic and anatomic criteria as follows: (1) proximal nondiffuse GC where the tumor is located mainly in the gastric cardia with evidence of precursor glandular dysplasia or in situ carcinoma in the presence of chronic inflammation, usually without atrophy; (2) diffuse GC, which may be located anywhere in the stomach with no apparent gastritis that exhibits an entirely diffuse pattern of infiltration of cells with a poorly differentiated phenotype; and (3) distal nondiffuse GC, which is located mainly in the distal stomach with evidence of chronic gastritis that is predominantly differentiated or exhibits an intestinal phenotype. In this study, they demonstrated that the three GC subtypes are distinguished by their gene expression profiles. Therefore, the genetic diversity of GC subtypes should be considered in studies of genetic and epigenetic alterations related to gastric carcinogenesis and progression. Prenyl diphosphate synthase subunit 2 (PDSS2) was identified in 2005 , and evidence indicates that it acts as a tumor suppressor ,. PDSS2 is required for the synthesis of coenzyme Q10 (CoQ10) ,, which is synthesized in the mitochondrial inner membrane and plays a vital role in the mitochondrial respiratory chain, pyrimidine nucleoside biosynthesis, and modulation of apoptosis . PDSS2 resides within the chromosomal locus 6q16.3-21, a site of frequent microsatellite DNA instability and loss of heterozygosity (LOH) in GC ,, supporting its role as a tumor suppressor in gastric epithelial cells. Moreover, PDSS2 may suppress the development of malignant melanomas and lung cancers ,. Moreover, Chen et al. reported that enforced overexpression of PDSS2 leads to apoptosis in a GC cell line by causing cell cycle arrest in the G0/G1 phase . These reports led us to make a hypothesis that PDSS2 is a potential GC-related gene and a candidate of novel clinically-relevant prognostic marker of GC. In this study, expression and methylation status of PDSS2 in GC were determined to evaluate the clinical significance and regulatory mechanisms of PDSS2 expression in GC. Our results indicate that PDSS2 expression provides a potential clinical biomarker of the progression and recurrence of GC. This study conformed to the ethical guidelines of the World Medical Association Declaration of Helsinki–Ethical Principles for Medical Research Involving Human Subjects and has been approved by the Institutional Review Board of Nagoya University, Japan. Written informed consent for usage of clinical samples and data, as required by the institutional review board, was obtained from all patients . Eleven GC cell lines (H111, KATOIII, MKN1, MKN28, MKN45, MKN74, NUGC2, NUGC3, NUGC4, SC-2-NU and SC-6-LCK) and CCL-241 (non-cancerous cell line derived from the small intestine) were obtained from the American Type Culture Collection (Manassas, VA, USA) or Tohoku University, Japan. The GC cell lines were cultured at 37°C in RPMI-1640 (Sigma-Aldrich, St. Louis, MO, USA) supplemented with 10% fetal bovine serum in an atmosphere containing 5% CO2. For CCL-241, 30 ng/ml of the epidermal growth factor (Sigma-Aldrich) was added in the medium. Primary GC tissues and corresponding normal adjacent tissues were collected from 238 patients who underwent gastric resection for GC at Nagoya University Hospital between 2001 and 2012. Patients who received neoadjuvant therapy were excluded because it was difficult to obtain cancer cells from scarred tissues. Specimens were classified histologically using the 7th edition of the Union for International Cancer Control (UICC) classification . Relevant clinicopathological parameters were acquired from medical records. To evaluate whether the expression level of PDSS2 correlated with tumor phenotype, patients were categorized into three groups according to the definition of GC subtypes according to the criteria of Shah et al. as follows: proximal nondiffuse, diffuse, and distal nondiffuse type. Since 2006, adjuvant chemotherapy using S-1 (an oral fluorinated pyrimidine) is administered to all UICC stage II–III patients with GC unless contraindicated by the patient’s condition . Patients were followed at least once every 3 months for 2 years after surgery and then every 6 months for 5 years or until death. Physical examination, laboratory tests, and enhanced computed tomography (chest and abdominal cavity) were performed at each visit. Chemotherapy for patients with distant metastasis or after recurrence was determined by physician’s discretion. Tissue samples were immediately frozen in liquid nitrogen and stored at –80°C. Tumor samples without necrotic areas (approximately 5 mm2) were extracted by gross observation and only samples confirmed to comprise more than 80% tumor components by H&E staining were included in this study. Corresponding normal adjacent gastric mucosa samples >5°Cm from the edge of the tumors were obtained from the same patient . Total RNAs (10 μg per sample) were isolated from 11 GC cell lines, CCL-241, 238 primary GC tissues and corresponding normal adjacent tissues were used to generate cDNAs, which were amplified using specific PCR primers (Additional file 1: Table S1). Real-time detection of SYBR® Green fluorescence intensity was conducted using an ABI StepOnePlus Real-Time PCR System (Applied Biosystems, Foster City, CA, USA). The expression of GAPDH mRNA was quantified in each sample for standardization. The qRT-PCR reactions in each sample were performed in triplicate. The expression level of each sample is presented as the value of the PDSS2 amplicon divided by that of GAPDH. PDSS2 mRNA expression was defined as decreased in GC tissues when its level was less than half that of the corresponding normal adjacent tissue. The nucleotide sequence of the PDSS2 promoter region was analyzed to determine the presence or absence of CpG islands defined as follows: at least a 200-bp region of DNA with a high GC content (>50%) and an Observed CpG/Expected CpG ratio ≥0.6 . We used CpG Island Searcher software (http://cpgislands.usc.edu/) to determine the locations of CpG islands . PDSS2 possesses a CpG island near its promoter region, and we hypothesized that aberrant methylation is responsible for regulating the transcription of PDSS2 in GC. DNA samples from 11 GC cell lines treated with bisulfite were subjected to MSP and nucleotide sequence analysis . The primer sequences used for MSP and bisulfite sequencing are listed in Additional file 1: Table S1. To assess the relation of promoter hypermethylation to PDSS2 transcription, GC cells (1.5 × 106) were treated with 5-aza-dC (Sigma-Aldrich) to inhibit DNA methylation and cultured for 6 days with medium changes on days 1, 3, and 5. RNA was extracted, and RT-PCR was performed as described . IHC analysis of the localization of PDSS2 was performed using a mouse monoclonal antibody against PDSS2 (ab119768, Abcam, Cambridge, UK) diluted 1:150 in antibody diluent (Dako, Glostrup, Denmark) to probe 30 representative formalin-fixed and paraffin-embedded sections of well-preserved GC tissue described previously . 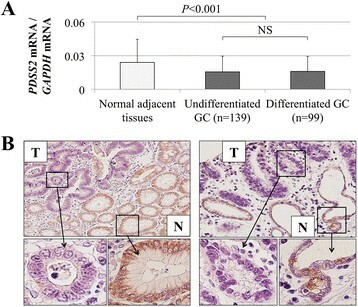 Staining patterns were compared between GCs and the corresponding normal adjacent tissues. To avoid subjectivity, the specimens were randomized and coded before analysis by two independent observers who were unaware of the status of the samples. Each observer evaluated all specimens at least twice to minimize intra-observer variation . Correlations between the pattern of PDSS2 mRNA expression and clinicopathological parameters were evaluated according to the differences among the three GC subtypes. Subgroup analysis of survival according to GC subtype was performed to determine the influence of PDSS2 expression on patients’ outcomes. Relative levels of mRNA expression (PDSS2/GAPDH) between GC and adjacent normal tissues were analyzed using the Mann–Whitney U test. The χ2 test was used to analyze the significance of the association between the expression and methylation status of PDSS2 and clinicopathological parameters. Disease-specific and disease-free survival rates were calculated using the Kaplan–Meier method, and the difference in survival curves was analyzed using the log-rank test. We performed multivariate regression analysis to detect prognostic factors using the Cox proportional hazards model, and variables with P < 0.05 were entered into the final model. All statistical analyses were performed using JMP 10 software (SAS Institute Inc, Cary, NC, USA). A value of P < 0.05 was considered statistically significant. A CpG island was identified in the PDSS2 promoter region using the CpG Island Searcher. The properties of the CpG island are as follows: 1655 bp, 55.9% GC, and 0.70 Observed CpG/Expected CpG ratio (Figure 1A). Therefore, we hypothesized that hypermethylation of the CpG islands regulates the expression of PDSS2 in GC. Methylation analyses of PDSS2 in GC cell lines. (A) The CpG island indicated by the blue line is centered on the PDSS2 transcription initiation site extending upstream into the promoter region. (B) Bar graphs indicate PDSS2 mRNA expression levels in CCL-241 (control non-cancerous cell) and GC cell lines before or after 5-aza-dC treatment. The methylation status of the PDSS2 promoter was evaluated using MSP, and the results are enclosed in the box. M, methylated; pM, partially methylated; U, unmethylated. (C) Representative results of bisulfite sequence analysis. All CpG sites in KATOIII cell were retained as CG and those of MKN74 were converted to TG. Significant decreases in PDSS2 mRNA levels were detected in seven (73%) of 11 GC cell lines compared with the expression level of the CCL-241 cell (Data for GC tissues are described below). There was no apparent difference in expression levels between cell lines derived from differentiated and undifferentiated GCs (Figure 1B). Hypermethylation of the PDSS2 promoter was detected in MKN1, SC-2-NU, KATOIII, MKN45, and NUGC3 cells (Figure 1B). To determine whether hypermethylation of the PDSS2 promoter inhibited transcription, mRNA expression levels were compared before and after treating cells with the methylation inhibitor 5-aza-dC. PDSS2 mRNA levels were restored in cells with down-regulated PDSS2 expression accompanying hypermethylation after 5-aza-dC treatment (Figure 1B), indicating that promoter hypermethylation inhibited PDSS2 transcription in GC. 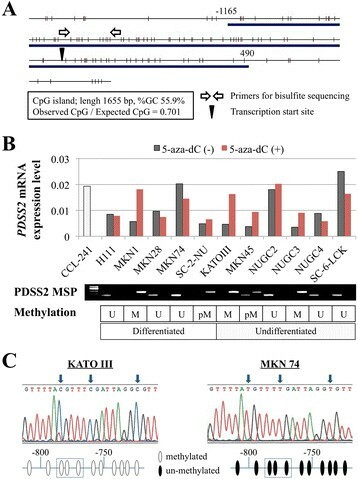 Representative chromatograms of the sequence analysis of the PDSS2 promoter region in MKN28 (complete methylation) and NUGC4 (absence of methylation) cells are shown in Figure 1C. The patient population included 179 males and 59 females aged from 20 to 84 years (65.3 × 11.7 years, mean × standard deviation). Pathologically, 139 and 99 patients were diagnosed with undifferentiated and differentiated GC, respectively. Patients were classified into the three GC phenotypes as follows: nondiffuse, 54; diffuse, 48; and distal nondiffuse, 136. According to the 7th edition of the UICC classification, 58, 40, 71 and 69 patients were in stages I, II, III and IV, respectively. One hundred sixty-four patients in stages I–III underwent R0 resection. Sixty of the 69 patients in UICC stage IV were diagnosed as stage IV due to positive peritoneal lavage cytology, localized peritoneal metastasis or distant lymph node metastasis. Eight of patients in stage IV had synchronous liver metastasis, one had lung metastasis, and they underwent gastrectomy aimed to control bleeding or obstruction to the passage of food. The mean expression level of PDSS2 mRNA was lower in GC tissues compared with that of normal adjacent tissues (P <0.001); however, there was no significant difference in PDSS2 mRNA expression levels between patients with undifferentiated or differentiated GC (Figure 2A). The expression pattern of PDSS2 was evaluated using IHC. Representative cases with reduced PDSS2 staining of GC tissues are shown in Figure 2B. Overall, the staining patterns of PDSS2 were consistent with the qRT-PCR data. Expression analyses of PDSS2 in clinical specimens. (A) The mean level of PDSS2 mRNA in GC tissues compared with the corresponding normal adjacent tissues and in GC tissues between patients with undifferentiated GC and differentiated GC. (B) Representative IHC data comparing PDSS2 expression in tumor and adjacent normal adjacent tissue (magnified 100× and 400×). N, normal adjacent tissue; T, tumor tissue. The expression of PDSS2 mRNA in GC tissues was decreased in 76 (32%) of 238 patients (less than half the level of expression detected in the corresponding normal adjacent tissues). The disease-specific survival rate of patients with decreased levels of PDSS2 mRNA in GCs was significantly lower compared with those without (5-year survival rates, 36% and 64%, respectively, P <0.001, Figure 3A). Decreased levels of PDSS2 mRNA in GCs were significantly associated with carbohydrate antigen (CA) 19-9 > 37 IU/ml and lymph node metastasis (Table 1). Univariate analysis of disease-specific survival showed that GC subtype (proximal nondiffuse or diffuse), CA 19-9 > 37 IU/ml, tumor size (≥50 mm), pT4, undifferentiated tumor, lymphatic involvement, vessel invasion, invasive growth, lymph node metastasis, positive peritoneal lavage cytology, and decreased PDSS2 mRNA expression in GC tissues were significant prognostic factors of adverse outcomes. Multivariate analysis identified decreased PDSS2 mRNA expression as an independent prognostic factor (hazard ratio 1.95, 95% confidence interval 1.22–3.09, P = 0.005, Table 2). The proportional hazards assumption in the Cox model was assessed with models including time-by-covariate interactions and no significant violations were found in the model. Prognostic implications of PDSS2 mRNA expression in patients with GC. (A) Disease-specific survival of patients with decreased PDSS2 mRNA in GC tissue. (B) (C) Disease-specific (B) and recurrence-free (C) survival among 168 patients who underwent R0 resection. *Statistically significant (P <0.05). GC, gastric cancer; UICC, Union for International Cancer Control. *Statistically significant in multivariate analysis. GC, gastric cancer; CI, confidence interval; UICC, Union for International Cancer Control. 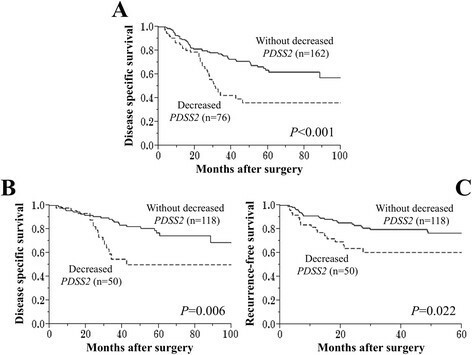 Of the 168 patients who underwent R0 resection, the disease-specific survival rate was significantly lower for those with decreased PDSS2 mRNA expression in GCs (n = 50) compared with those without (n = 118) (5-year survival rates, 50% and 77%, respectively, P = 0.006, Figure 3B). 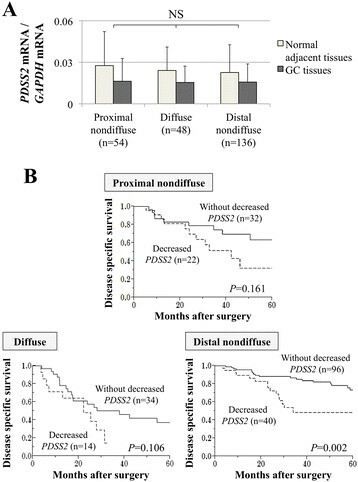 Patients with decreased PDSS2 mRNA expression in GCs experienced significantly earlier recurrences after surgery compared with those without (2-year recurrence-free survival rates, 64% and 84%, respectively, P = 0.022, Figure 3C). Initial recurrence sites of 43 relapsing patients with decreased PDSS2 mRNA expression in GCs were peritoneal in 21 (49%), liver in 6 (14%), lymph node in 13 (30%) and others (e.g. lung and bone) in 3 patients. On the other hand, those of 61 relapsing patients without decreased PDSS2 were peritoneal in 35 (57%), liver in 10 (16%), lymph node in 8 (13%) and others in 8 patients. Patients with decreased PDSS2 mRNA expression in GCs were likely to have a node relapse, though it did not reach the statistical significance. Mean PDSS2 mRNA expression levels were equivalent in GC and normal adjacent tissues (Figure 4A). Similarly, the prognostic value of decreased PDSS2 mRNA expression in GCs was comparable among the three GC subtypes (Figure 4B). Subgroup analysis of GC subtypes. (A) PDSS2 mRNA expression levels among the three GC subtypes both in GC and normal adjacent tissues. (B) Comparison of disease-specific survival of patients with and without decreased PDSS2 mRNA expression in GCs of each GC subtype. PDSSs are heterotetrameric enzymes comprising subunits encoded by PDSS1 (10p12.1) and PDSS2,. PDSS activity requires both subunits ,,. The association of PDSS2 with GC was considered because of its chromosomal location (6q21), and because of its inactivation or loss from certain malignancies ,. Here we show that PDSS2 mRNA was heterogeneously expressed in GC cell lines, and its expression was inhibited in 73% and 32% of GC cell lines and tumor tissues, respectively. We detected hypermethylation of the PDSS2 promoter in five (45%) of 11 GC cell lines with significantly decreased levels of PDSS2 expression. Further, PDSS2 transcription was reactivated after cells were treated with an inhibitor of DNA methylation. These findings are the first to our knowledge to show that promoter hypermethylation regulates PDSS2 transcription. However, PDSS2 expression was decreased in some GC cells without hypermethylation. Because chromosome 6q is a frequent site of LOH in GC ,,, LOH may regulate PDSS2 expression as well. There has been a report demonstrating that PDSS2 was expressed at decreased or undetectable expression in a small number of biopsy GC samples . In the present study, we analyzed 238 surgical specimens of tumors and the corresponding uninvolved tissue to gain further insight into the clinical significance of PDSS2 expression in GC. Consistent with analyses of malignant melanoma and lung cancer ,, most patients with GC harbored a decreased level of PDSS2 mRNA in GC tissues, and the mean PDSS2 expression level was significantly decreased in GC compared with normal adjacent tissues. IHC was conducted to determine whether the mRNA level reflected PDSS2 protein expression. Because the IHC results indicated that the mRNA data were consistent with the protein level, subsequent analyses were performed according to the mRNA data, which are more amenable to the quantitative analysis ,. Decreased PDSS2 mRNA expression in GCs was significantly associated with elevated preoperative CA19-9 levels and lymph node metastasis and was identified as an independent prognostic factor. Moreover, patients with decreased PDSS2 mRNA expression in GC tissue experienced significantly earlier recurrence after R0 resection. Recently, Chen et al. investigated the tumor-suppressing activity of PDSS2 in lung cancer . They reported that the forced overexpression of PDSS2 caused massive cell death through apoptotic pathways and significantly inhibited colony formation and there was an inverse correlation between PDSS2 expression and gelsolin expression, which is known to inhibit apoptosis and enhance cell invasion and metastasis , though PDSS2 did not influence the sensitivity of the cancer cells to chemotherapeutic drugs . This tumor suppressive mechanism of PDSS2 might be applied to GC as well. The expression pattern of PDSS2 mRNA and its prognostic impact were similar among the three GC subtypes (proximal nondiffuse, diffuse, and distal nondiffuse), indicating that PDSS2 expression influences the pathogenesis of all types of GC. Shah et al. reported that one-third of amplified genes, possibly including PDSS2, showed equivalent expression pattern among the three GC subtypes . GC is one of the tumors with a high frequency of aberrant methylation, and it frequently exhibits the CpG island methylator phenotype ,. The expression of a large number of genes is suppressed by CpG island hypermethylation in GC cells, including those encoding tumor suppressors, cell cycle regulators, inducers and executioners of apoptosis, proteins that promote the invasive phenotype, and DNA mismatch repair enzymes . These epigenetic alterations can serve as biomarkers that illuminate an increased metastatic potential and aggressive tumor phenotype  as well as therapeutic targets . Therefore, identification of other genes that are regulated by methylation in GC cells will likely improve the management of GC. The tumor suppressive function of PDSS2 are supported by the present findings as follows: (1) decreased expression of PDSS2 was frequently detected in GC tissues, (2) the mean level of PDSS2 expression was significantly lower in GC tissues, and (3) decreased expression of PDSS2 was associated with early recurrence and subsequent poor prognosis. PDSS2 expression levels in biopsy tissue obtained using endoscopic surveillance samples or in surgical specimens may be useful for predicting early recurrence and poor prognosis, which will likely aid efforts to design more efficacious therapeutic strategies. This study was limited by its lack of sufficient functional analysis of PDSS2, which tempers the conclusion that it acts as a tumor suppressor in GC. Further studies including pathway analysis in gastric carcinogenesis and functional analysis are expected to clarify the molecular mechanisms underlying the biological activities of PDSS2 in GC. In conclusion, our findings support the conclusion that the expression of the putative tumor suppressor gene PDSS2 is regulated by promoter hypermethylation in GC cells and indicate. Our results indicate further that decreased expression of PDSS2 mRNA may represent a novel biomarker for progression and recurrence of all types of GC. MK, HO, FS, DS, HT, RH and KM performed experiments and data analysis. DK, CT, SY, TF, GN, HS, MK, MF and YK collected cases and clinical data. MK and SN conceived and designed the study, and prepared the initial manuscript. YK supervised the project. All authors contributed to the final manuscript. All authors read and approved the final manuscript.